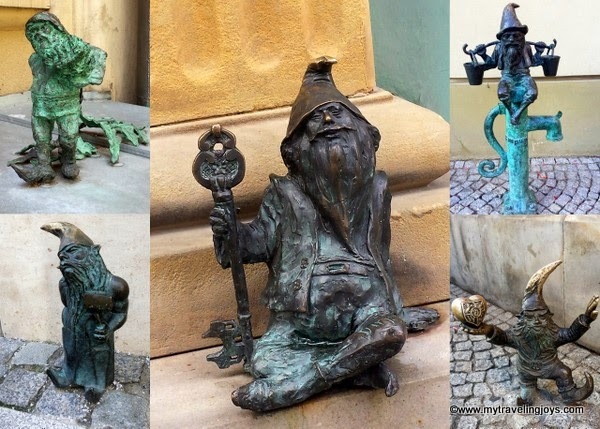 Little kids and big kids like myself would probably enjoying hunting for these small dwarf sculptures that call Wrocław home. 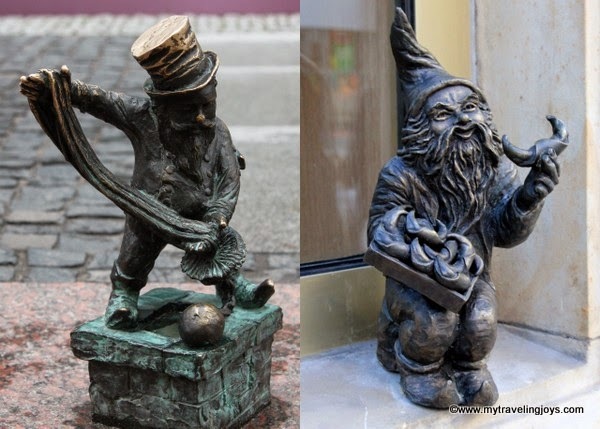 During our weekend in Wrocław, a beautiful city located in southwestern Poland, I think we discovered 50 of these dwarves, at least that’s my count as I looked through our photos again. We found them hanging from light poles and signs, sitting in front of pierogi restaurants and banks and simply chilling in the middle of cobblestone sidewalks. If you weren’t careful, you could practically trip over one. Not all the names seemed to translate well. For example, these guys were called Lifting and Pushing the Ball Dwarves. 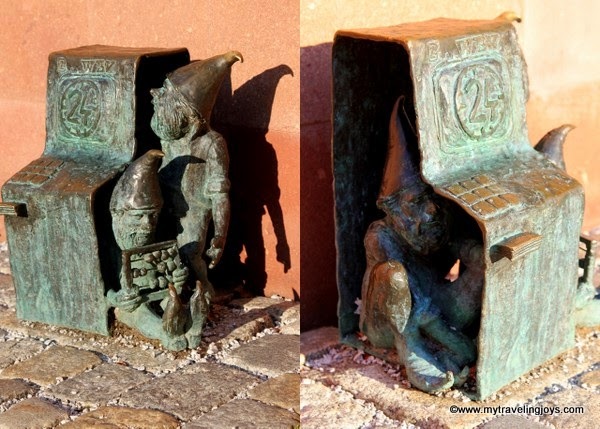 Hunting for dwarves is the second biggest attraction in ‘Vrots-waff,’ as the city is correctly pronounced in Polish. 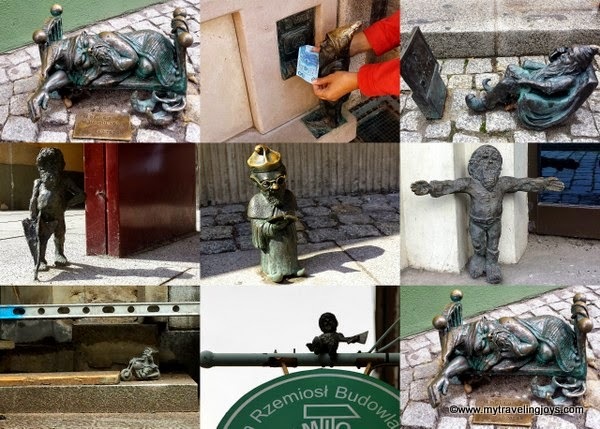 You’ll find more than 200 of these fairy-tale creatures that actually symbolize the Orange Alternative Movement, which aimed to ridicule the city’s Communist regime in the late 1980s. 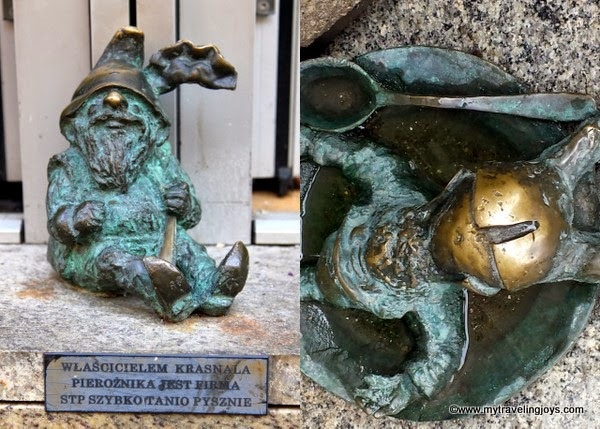 During that time, the Movement supporters often wore bright orange hats or drew pictures of gnomes on buildings wherever antigovernment slogans had been erased. 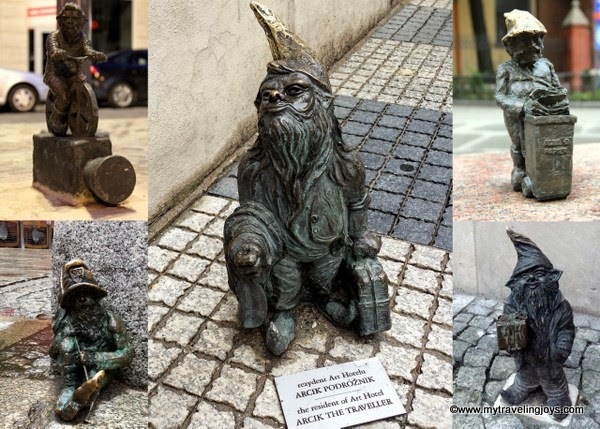 In 2005, Polish artist Tomasz Moczek initiated and created some of the dwarf sculptures and the movement has grown since then. The Disabled, Blind and Deaf Dwarves. We bought a map from one of the local tourist stands so we could be more precise in our dwarf hunting. We also rented our favorite NextBikes so we could quicken our search around the city. However, even with the map and bikes, the hunt was more difficult than we planned. Some dwarves were missing or (sadly) stolen as we were told when we asked where the dwarf was that was supposed to be somewhere. Finally, we got the hang of the search and realized we had to look up, down and sideways in order to find the dwarves. 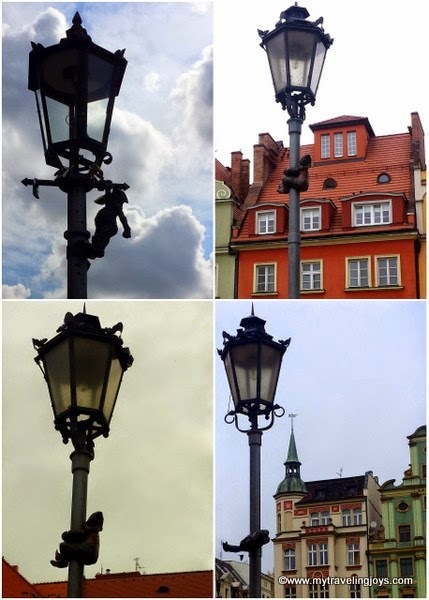 Very popular lamp post dwarves. The search was like hunting for Snow White’s Seven Dwarves and their 200 cousins. There was Arcik the Traveler, Kinomatic and the Ecological dwarves. As well as the naughty Prisoner Dwarf, who actually resides in the city’s former prison. And the cute ATM dwarves, which really counts as three separate ones. 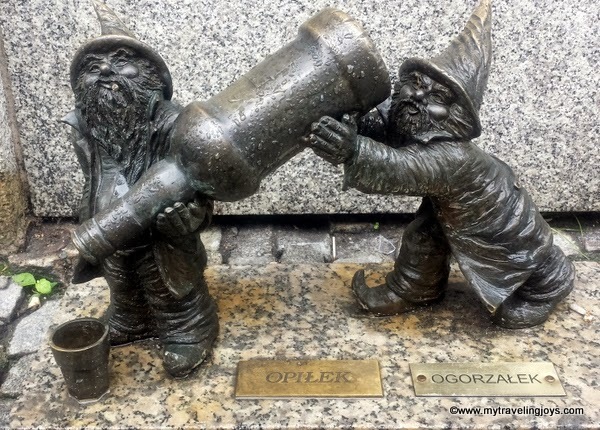 The Pieorogi and Gourmand dwarves, who must have eaten too many Polish pierogies. 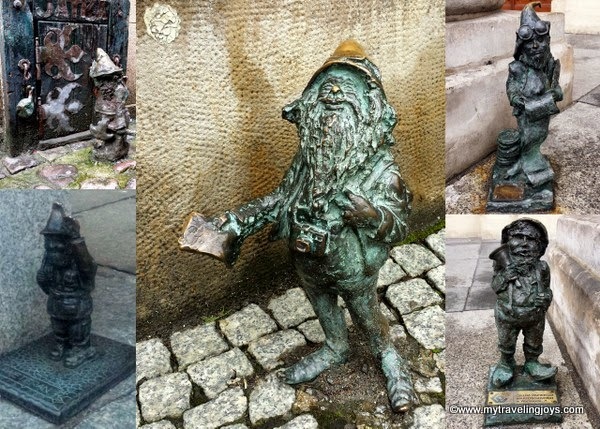 Hunting for these miniature dwarves was a fun way to explore Wrocław while we took in some of the popular historical sites as well. It’s another Polish road trip that I definitely recommend. 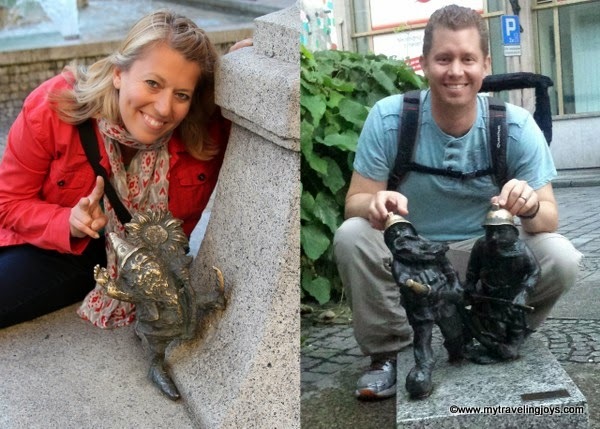 The Drinker and the Distiller hanging out in Stary Miasto. Yes, we had fun hunting for the wee dwarves! oh what fun! and what a cool thing for a town to do! thanks for giving the pronunciation. i never can guess how polish sounds. i sure wish my father had spoken polish at home. 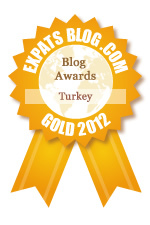 I enjoyed reading about your slightly offbeat adventure in Wroclaw, thank you. Interesting that this movement caught on the way it did. That's something you never did in Istanbul. @Joyce, It was fun, and Polish is the most difficult language I've ever had to learn! Plus, the grammar does NOT make sense most of the time!